Last night, Ariana tweeted, “The whole “the toms are idiots” schtick is so old and tired. Why can’t it just be real? Way more interesting imo.” Plus, they want people to go to this restaurant right? Wouldn’t it be a good idea to make potential customers think that it is actually ran by competent individuals? Ariana responded by breaking down that fourth wall. She revealed, “We receive call times for filming,” i.e. Tom and Tom had a set call time to show up. Therefore, no one was shocked by their presence and they did actually follow directions. However, this just wasn’t mentioned on the show. Of course. Once again, this fan, just couldn’t pick up what Ariana was laying down, insisting, “As I said that they were TOLD NOT to go there!! !” Was she just not reading Ariana’s tweets? Did she just not care? Or was it still (somehow) unclear? Ariana’s reply was loud and clear: “They. Got. A. Call time. This is not hard. Do i need to tell you what a call time is.” Apparently. Obviously, Ariana used Twitter to fill in the gaps since it’s impossible to see every single aspect on the show. This person just wasn’t getting that. At all. ARIANA WAS EXPLAINING IT TO THE VIEWERS via tweet. Wow. Some people just don’t listen (or read). Production gave Tom and Tom a call time. They were scheduled to show up at the restaurant. They showed up when they were supposed to and it was not a surprise. Once again, Ariana clarified, “It’s called breaking the fourth wall. Something we aren’t allowed to do.” And that’s where social media comes in. Then, Ariana declared, “We show up when we are given call times by our employers: production. I hope you find some relaxation in your future bc jeez.” Preach. Ariana responded, “No you definitely aren’t.” But are we ever? It’s impossible to truly see the “whole picture” on a reality TV show. There are countless hours of unseen footage. TELL US- WHAT DO YOU THINK ABOUT ARIANA’S TWEETS? 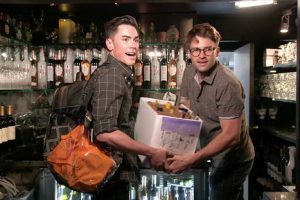 DID PRODUCTION SET UP TOM SANDOVAL & TOM SCHWARTZ TO LOOK INCOMPETENT FOR THE SAKE OF A STORYLINE? WOULD YOU GOT TO TOMTOM IF YOU HAD THE CHANCE?